Training Materials for developing an orientation handbook. This course is designed for training Human Resource departments how to get employees off to a good start by creating an amazing orientation handbook. Confidently teach your HR managers how to find, hire and keep good people, learn why perception is important, how to prepare effective training and more! Seeing is Believing This sample manual to teach Orientation Handbook is in MS Word format. One reason people change jobs is that they never feel truly welcome or a part of the organization they join. If a company spends considerable money recruiting, interviewing and perhaps even relocating employees, it makes good sense to go one step further and make the new employee feel like they have made a good decision to come to this company. 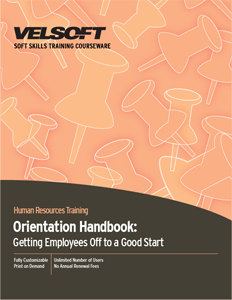 A thoughtful new employee orientation program, coupled with an employee handbook that communicates workplace policies can reduce turnover and save that organization thousands of dollars. Whether your company has two employees or two thousand employees, don't leave new employee orientation to chance.